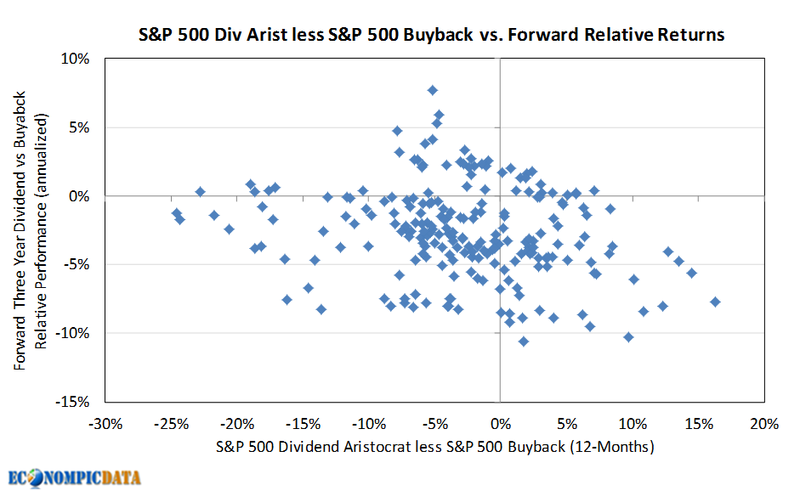 Earlier this month, in my post Stock Buybacks Demystified I attempted to remove some of the mystery surrounding buybacks, showing they are no different from an economic perspective (if you ignore the impact of taxes and the effects of signaling) than dividends. 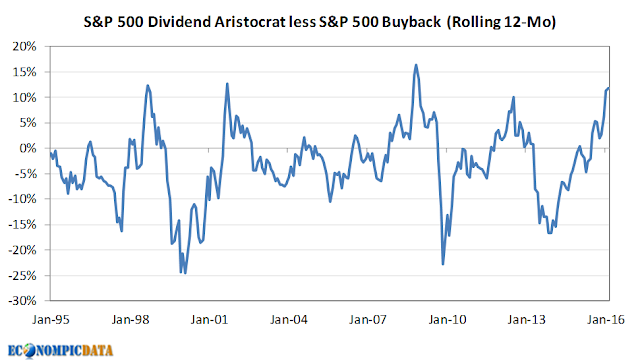 Given the recent outperformance of dividend paying stocks (as defined by those in the S&P 500 Dividend Aristocrat index) vs. stocks engaged in buybacks (as defined by those in the S&P 500 Buyback index) over the last year, I thought it might be helpful to demystify what has driven the recent outperformance of dividend stocks, share the historical performance of each, and outline some forward expectations for relative performance given where we currently sit. 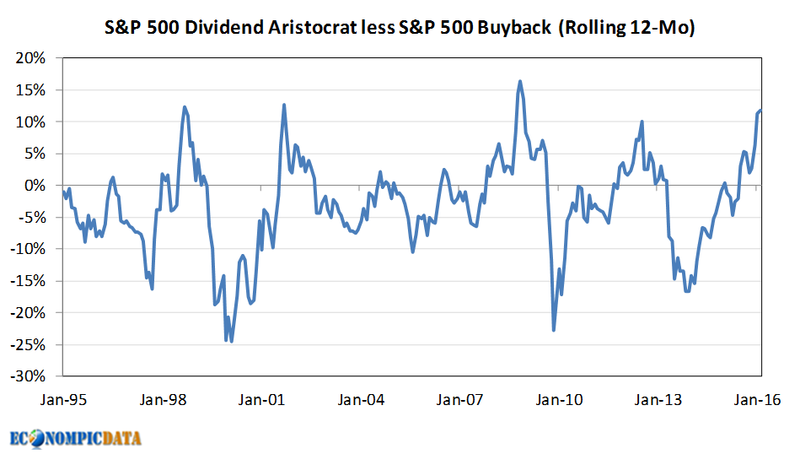 The first chart shows the growth of $1 invested in dividend stocks vs $1 invested in buyback stocks going back to the inception of the S&P 500 buyback index in early 1994. What we see is pretty consistent underperformance of dividend paying stocks over time that has compounded to 2% / year outperformance of the buyback stocks since inception (note both have outperformed the S&P 500). In addition to market stress that favors dividend stocks, the change in relative valuations have driven dividend stocks (i.e. it's been seemingly more technical than fundamental). The chart below shows valuations (i.e. P/E) of the dividend and buyback indices as of month-end February and as of a year ago. While dividend stocks were richer by this measure even a year ago, valuations among dividend stocks have held up pretty well. On the other hand, valuations among buyback stocks have gotten materially cheaper, driving the relative underperformance of buyback stocks and creating a huge valuation gap between the two. Neither dividend stocks or buyback stocks outperform in all periods or market environments, but under the view that the underlying economy appears to be holding up, current valuations, the historical outperformance of buyback stocks, the mean-reversion characteristics of buybacks (following recent dividend outperformance), and certainly the tax efficiency of buybacks all seem to support a tilt toward buybacks. Buybacks are done when stocks are rich: if the stock of a company performing buybacks is "rich", then why are you owning it to begin with? 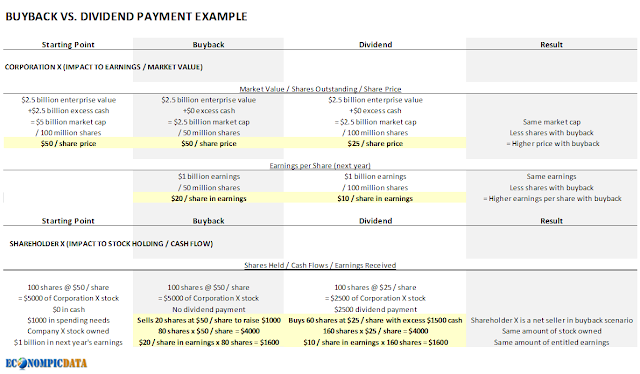 * In the buyback scenario, $2.5 billion is bought back by Company X, but if all shareholders acted like Shareholder X, they would sell $1 billion for their spending needs ($1.5 billion net purchases); in the case of dividends, of the $2.5 billion distributed, $1 billion is spent, and the same $1.5 billion is used to buy back shares with the excess cash. As highlighted above under 'what has changed', household outflows are in fact impacted on the margin by the form of capital distribution (i.e. 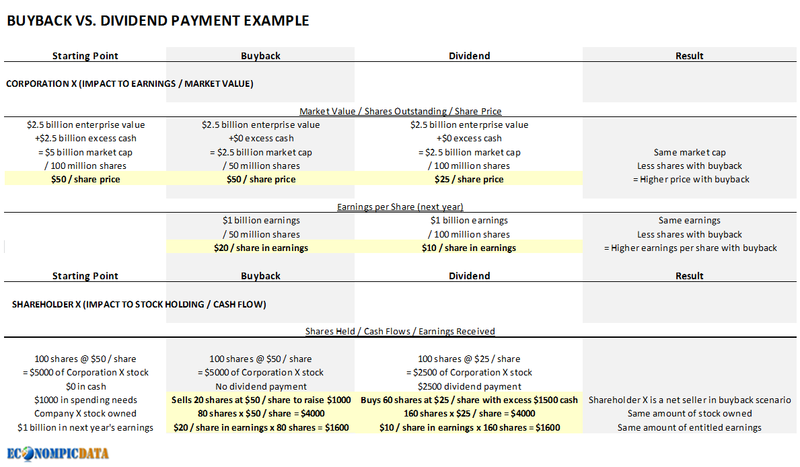 whether it is received via buyback or dividend). 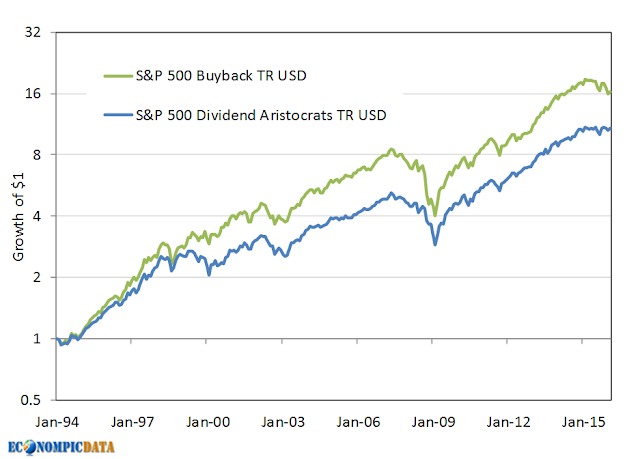 In the case of a buyback, households are simply creating their own dividend through the sale of shares. Given the two situations are identical in terms of overall demand for Company X stock (demand at time 0 was $5000 worth of stock, post spending it was $4000), we can see why flows really don't matter. 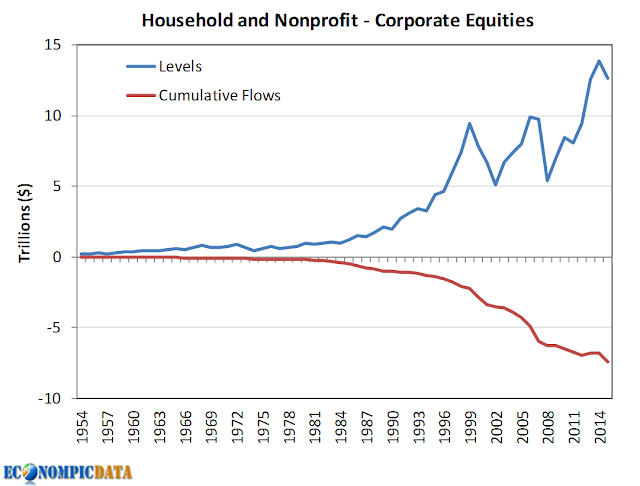 In fact, while the initial chart circulating through Twitter highlights the negative flows from the household sector for stocks from 2008-2015, what may be a surprise is that the overall level of stocks held by the household sector (i.e. a better measure of demand) jumped from $5.4 trillion at the end of 2008 to more than $12.7 trillion over that same time frame (as of 9/30/15 - the latest z.1 report), a normalized increase of 37% of GDP to 70% of GDP. But a key point is that household net flows for a mature / functioning economy should be negative... when markets have positive returns, investors put in less money today than what that investment should compound to when they make withdrawals in the future. Thus, it should be no surprise that net flows from the household sector have historically been negative over all longer periods of time going back 60 years, while the amount of stock held by the household sector has continued to move higher. 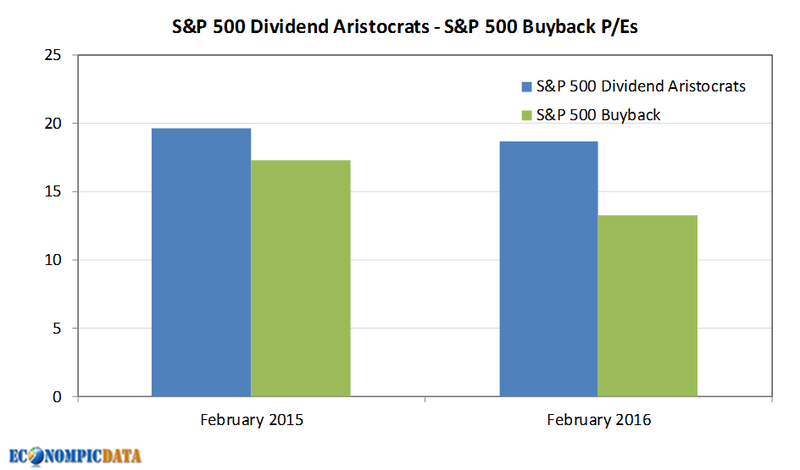 To summarize... the form of distribution really does not matter and buybacks are not evil... the next time you hear someone state buybacks are the cause of the run up in stocks, try replacing the word buyback with dividend. "Stocks are up because of a huge increase in dividends" sounds a lot less controversial than "stocks are up because of a huge increase in buybacks", though they are both identical signs that the performance has been driven by an improvement in fundamentals and an increase in cash flows.